Lemon balm is a quick-growing perennial that will spread in its growth, forming a thick mass about 3 feet high. If you do not cut it back at least once during the growing season, it tends to fall over and get spindly. You can use the cuttings to harvest the lemon balm for use as an herb in your kitchen. Try taking weekly cuttings. Jeanine M. Davis, a horticulturist specialist, recommends this as "frequent trimming encourages branching and will result in a bushy, compact plant." Choose a dry morning to harvest your lemon balm. If you wait a few hours after sunrise, the morning dew will have enough time to dry. Cut off the stems of the lemon balm about 6 inches from the top. Make this cut just above a leaf set so there will not be too much stem left sticking out of the plant. Place the cuttings in a colander and rinse them briefly if necessary. 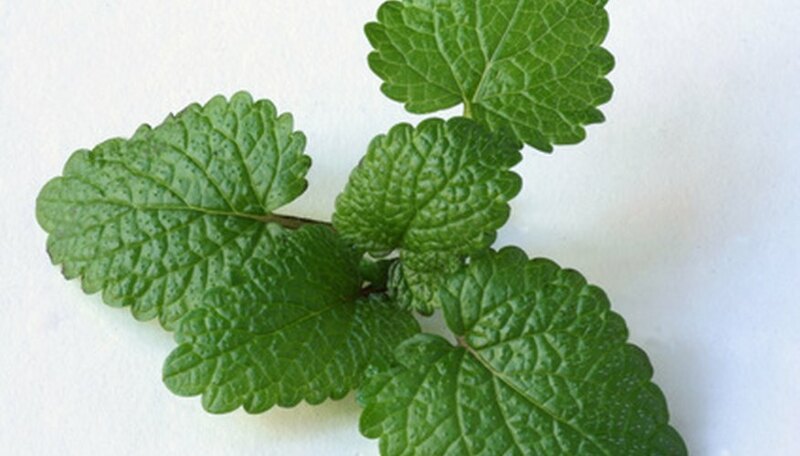 You can use fresh lemon balm leaves in a salad or chopped in salsas or for a variation on the traditional mojitos. Of course, they are such a pretty leaf; you can use them just after harvest as a garnish for a nice dinner plate. Cut the stems in the same way as you did for fresh harvesting, only this time, wait until the plant has started blossoming. Make your cuts about 6 inches up from the ground, leaving two or three sets of leaves on each stem. Bundle about a dozen stems together loosely with a large rubber band. If they are too tight, the air will not be able to get in between the stems and the moisture in the plant may cause mold to grow. Place them upside down in a paper bag and store it in a cool dark place for about two months. The leaves should dry with a nice green color. You can strip them from the stems and use them as a dried tea or dried herb. Store the dried leaves in an airtight container in a dark place. Maryland resident Heide Braley is a professional writer who contributes to a variety of websites. She has focused more than 10 years of research on botanical and garden articles and was awarded a membership to the Society of Professional Journalists. Braley has studied at Pennsylvania State University and Villanova University.